I didn’t really know what to put in my Shadow Box since I was pretty short on ideas. Now that I see my shadow box I can see that it represents my identity as a whole. The plushy represents my love in humor, and the flag represents my gender identity which is being transmale. The rainbow also represents my sexuality. Seeing that my race is African-American, it’s consider “out of the ordinary” for people like me to come out as transmale. I’ve been told that it’s just a phase and how I’m becoming a “dyke.” I’m really proud of who I am and I’m not ashamed to come out as people may assume. It really doesn’t bother me anymore since I already have people who help support me and I couldn’t be more thankful. My gender expression is not too masculine but not feminine as long as I’m seen as and am male then it doesn’t really matter about what I wear. I did put a bit of my drawings in here since I do like drawing in my spare time or when I’m just bored.The aliens represent my love in conspiracies and how I’m a generally weird person from other people’s perspective. The picture on the right side of my shadow box shows how I’m still kinda dealing with insecurities and how I’m not really in tune with my emotions as often. I feel like I’m more expressive when I draw or craft something since I can make it with my ideas and I feel more free when I do it. My True Identity: Adrian Kelly by Adrian is licensed under a Creative Commons Attribution-ShareAlike 4.0 International License. I am happy about your paragraph, My True Identity: Adrian Kelly / shadow box, because It looks very pretty. I like the drawings you have there; You’re a good artist. It’s also pretty cool how you made your flags. You’re paragraph, also holds a lot of information about yourself, but it’s not too much. It’s simple so it’ll make people have a better understanding of who you are, and how you identify as. One sentence you wrote that stood out to me was “I didn’t really know what to put in my Shadow Box since I was pretty short on ideas. Now that I see my shadow box I can see that it represents my identity as a whole”(Adrian Kelly). This stood out to me because I too had difficulties on thinking of what to put in my shadow box. In the end, your shadow box looks fantastic! Thanks for sharing your amazing work with everyone. I look forward to seeing what you write next, because I just loved your shadow box because it was simple, and pretty and it looked nice. I also enjoyed reading your paragraph, so I hope to read more of it! Thank you for sharing your work. My name is Jayda and I am a student at Fremont High School. Thank you for sharing your work. My name is Karina Dealba and I am a student at Fremont High School. Something I liked about your work was how it looks very colorful. Something I have a question about is what does the small shoe represent? Please feel free to comment on my work in the future. The address of my student blog is http://karinadfhs2021.edublogs.org/. Thank you for sharing your work. My name is Juana and I am a student at Fremont High School. Something I liked about your work was that you made your project colorful and that you were brave to talk about something personal. Something I have a question about is Why do you feel insecure? Please feel free to comment on my work in the future. The address of my student blog is http://juanamfhs2021.edublogs.org/2017/11/07/assignment-5/ . Hi my name is Jose! Your shadow box is beautiful. I am very happy for you, and I respect the courage you have to stand for who you are and what you believe in. I know it’s not always easy to feel different from everyone else, but it is great you have people in your life who support you. I, too, am African American and understand that being a minority isn’t always easy. You seem to have a great head on your shoulders. Keep it up, and don’t let any thing or anyone ever cover up your sunshine. Hi! My name is Juan and i’m writing from Fremont High School. I am impressed about your work and the way you made it, it just looks perfect. I really loved your shadow box. You are a really brave and courageous person for speaking up for what you believe in. I really admire that fact of how you included some pieces of you and and what you believed in your box. The quote that stood out to me and made me want to read more was, “The rainbow also represents my sexuality. Seeing that my race is African-American, it’s consider “out of the ordinary” for people like me to come out as transmale. I’ve been told that it’s just a phase and how I’m becoming a “dyke.” I’m really proud of who I am and I’m not ashamed to come out as people may assume.” It’s very aspiring to see the confidence and pride that you have. Have a lot of confidence. That will help you a lot in the future! Adrian, you are a beautiful human being and don’t let anyone tell you otherwise. You are very brave and courageous to come out in the circumstance you did, even when you knew not everybody would accept you for who you are. It is very inspiring to see you so proud of your sexuality. One thing to remember is that although you came out and people may not “agree with that”, you are still you. The same Adrian since the day you were born- same personality, just different pronouns they have to call you by, right? So if anyone starts talking smack, they really don’t have any reason to because you’re still the same beautiful person before they knew. 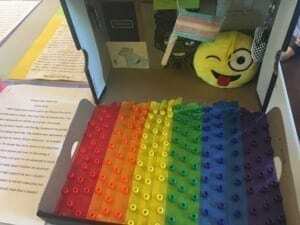 I also love how your pride flag colors are right up front in your shadow box! You’re not afraid to flaunt those colors and that is remarkable. I found this really nice article that you might want to read sometime https://pointofpride.org/trans-guy-walks-gay-bar/ , and one of my favorite advocates (I’m not sure if you’re aware of him), for the LGBTQ+ community, is Todrick Hall. He is a gay African American man who is making way into this world by not being afraid of expressing his sexuality and the things he can accomplish. I think he is a great role model to look up to and is amazingly talented showing that you don’t have to stick to the stereotypes. He made this musical biography on his upbringing if you want to watch it; (I mean, I love it) https://youtu.be/4mUSwHhJ6zA . Again, you are an amazing beautiful soul who should be proud of who you are, and even when people are ignorant, just remember you are loved and supported by many. ” I’m really proud of who I am and I’m not ashamed to come out as people may assume.” Your confidence encouraged me to read your article, and I was not disappointed. While I think stories of victim hood are important in order to understand that the plights of members in the LGBTQ+ community are not unfounded, hearing stories about confident queer people is good to. Finding another African American who identifies as part of the community is cool to. Hearing more about your experiences would definitely make me a regular reader of your posts. Have you felt the need to become incredibly “masculine” to affirm to others that you are male, or have your habits/sense of style stayed relatively the same? Do you have a good support group? I hope you have a good support group. If you’re looking for support or just people who have gone through similar experiences, you should check out Tumblr. Using the # filter always brings up cool stuff for me, ranging from serious to casual. Hi Adrian!! Your shadow box is beautiful. I am very happy for you, and I respect the courage you have to stand for who you are and what you believe in. I know it’s not always easy to feel different from everyone else, but it is great you have people in your life who support you. I, too, am African American and understand that being a minority isn’t always easy. You seem to have a great head on your shoulders. Keep it up, and don’t let any thing or anyone ever cover up your sunshine.